IT'S EASY to be accepting of your life, to feel grateful, when you have food in your stomach, or when you have money in the bank, or when your health is good. The real spiritual challenges come when life is not going so well, times when the cosmic forces seem aligned to challenge your every step. In these more difficult times, learning to practice non-resistance and acceptance can truly be transformational. It's the practice of surrendering to "what is." One way to develop the ability to surrender is to express gratitude for the very situation that troubles you. Being thankful underscores the practice of acceptance and allows you to modify the energetic patterns around you. And as the energies shift, the situation may also shift in a more positive direction. This does not mean that pain, suffering and injustice are ignored or pretended away. Rather it means remembering that acceptance and thankfulness are important components for our growth along our spiritual paths. The pack of 78 Tarot cards offers a number of images that portray life's more challenging times, times we think of as the "dark night of the soul." The Five of Pentacles is one good example. The foreground in this card shows two bereft figures who are injured and haggard – a woman in ragged clothes and a boy on crutches, with no shoes on his feet. They appear to be trudging along, passing by a church window. It is cold, snowing and bleak. This is a card that shows suffering and loss and probably not one that you'd like to see in your Tarot reading. The Pentacles suit of the Tarot, as a whole, relates to the material and physical realm – that is, finances, material gain, money, stocks and bonds, real estate -- all those components that comprise our physical reality. It also suggests the body itself as well as the earth, the land we live upon and the homes in which we live. Thus, the troubled imagery of the number five of this suit depicts problems of a material or corporeal nature, such as poverty, illness and homelessness. Metaphorically, since the figures in the foreground are outside of what appears to be a church, it may also suggest a lack of faith in God, or in your abilities to create a healthy body or home. Since the beggars are passing outside the church, another conclusion might be that they've been turned away by the church or that they are in their present circumstances because they chose not to enter the church (that is, not to attend to their spiritual needs). Note: this is not meant to represent a punishment! Rather, it suggests a symbolic interpretation of how we may feel if we ignore our own inner spirituality. It may also portray and include an interior desolation, feelings of despair, worthlessness and abandonment. It is true that inner despair can often be the result of a spiritual lack. In fact, some would say that our society promotes the value of outward abundance over inner fulfillment which, in turn, results in an inner emptiness. Further, when this card appears in your reading, it may, recommend a time to take care of your physical self, pay attention to your health, or ask others for help. Other examples of problem cards are the Eight of Swords, the Nine of Swords, the Two of Swords and the Ten of Wands, to name a few. These cards depict difficult situations that come up in life for everyone -- experiences that leave us feeling stuck, remorseful, despairing, overwhelmed, over-burdened and incapable of making decisions. The idea of non-resistance and acceptance states that we cannot make or force these kinds situations to go away and that we can better cope with them by learning to "be" with what is happening. We can experience a sense of freedom and power from such situations by consciously choosing to stay in the present time, by grounding ourselves in our breath and in our bodies, and by replacing the anger and fear with acceptance. Each Tarot image is an archetype, a universal human situation. Each archetype holds a full spectrum of possible interpretations, from the most negative to the most positive. The negative pole of a tarot image is called the "shadow" and the positive pole is the "gift." Each tarot card, therefore, has both shadow and gift aspects. The gift of the archetype is a positive and hopeful explanation that we use to help us live more successfully. The shadow is the more negative interpretation and usually shows a darker aspect of the psyche, a piece that most of us would rather not admit that we have. The Five of Pentacles's shadow aspects are obvious: financial loss, illness, inner isolation, anguish, and spiritual bankruptcy. What could possibly be the gift for, and of, these sorrowful individuals? What good could there be in such desolate imagery? What about the grief being expressed in the Nine of Swords? What could be positive about this degree of anguish? Or what about the feeling of paralysis depicted in the Eight of Swords? For those who seek to embrace a spiritual perspective in life, there is a key teaching to be found in such images. These types of cards and the experiences they represent may come up in your life to remind you of the value of non-resistance, acceptance and even gratitude. These kinds of life experiences offer us portals into an awakened state of consciousness where we are no longer conditioned to act out of old patterns or to react to present events as if they were past events. These kinds of difficult experiences can offer portals into the present moment -- teaching us to be in present awareness. 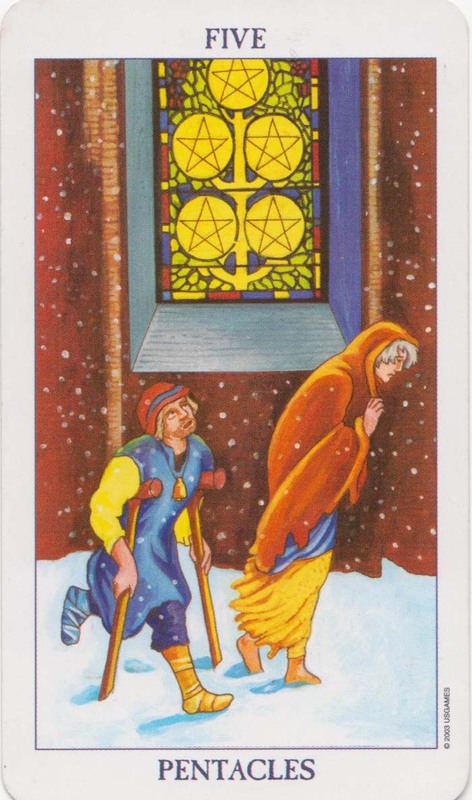 The Five of Pentacles reminds us that there is hope or salvation available through the spiritual realm (the church window). Thus, the esoteric message of this card is to accept the situation you may be in, just the way it is, even if you don't understand it. As you sincerely express your acceptance and gratitude, begin to watch how you feel inside and observe how the energy around the situation shifts. As your attitude changes, the circumstances of the situation may be also be transformed. To experience acceptance during difficult times calls for self-discipline and practice -- it may not be easy, but this is when acceptance counts the most. Buddhism teaches that the spiritual path is about blessing all of life's experiences. It says that embracing a situation that brings suffering may release powerful energies that can be personally transformative. Knowledge and power can emerge out of our shadows, pain and suffering. Jack Kornfield, author of A Path with Heart, talks about the importance of blessing all aspects of life. "To discover the capacity to bless whatever is in front of us . . . is a freedom and happiness . . . a gift we bring to each moment and each encounter." He recommends one simple mantra: "This too, this too." / By accepting and including all of life's experiences, we are able to find an inner calm. The idea of embracing the "what is," is not new. Buddha also talked about the root of suffering coming from attachment to that which is fleeting. Werner Earhart, founder of EST, used to declare: "Choose it." He spoke about "riding the horse in the direction it is going." Other contemporary spiritual teachers such as Wayne Dwyer, Deepak Chopra and Eckhart Tolle also talk about the value of living in the present moment, without resistance, living in neither the past or future. Tolle encourages us to "accept each moment as if you have chosen it." Now there is a powerful concept. Live each moment as if you have chosen it! Tolle also recommends that we learn to "inhabit the present moment and honor the present moment." Consider all the ways we resist the present moment -- by complaining, by criticizing, by wishing we were somewhere else, by rehashing the past, by imagining that we will be happy when we achieve this or that. As we partake in these kinds of thought patterns, as we deny the present moment, we ensure that the very thing we seek to resist has even greater power over us. BUT, when we are able to drop our inner resistance, we are able to open space around ourselves and the situation we are in, so that a shift may often occur. There is a miraculous power in giving up our resistance, in surrendering. Is there a situation in your life right now that reminds you of the Five of Pentacles? 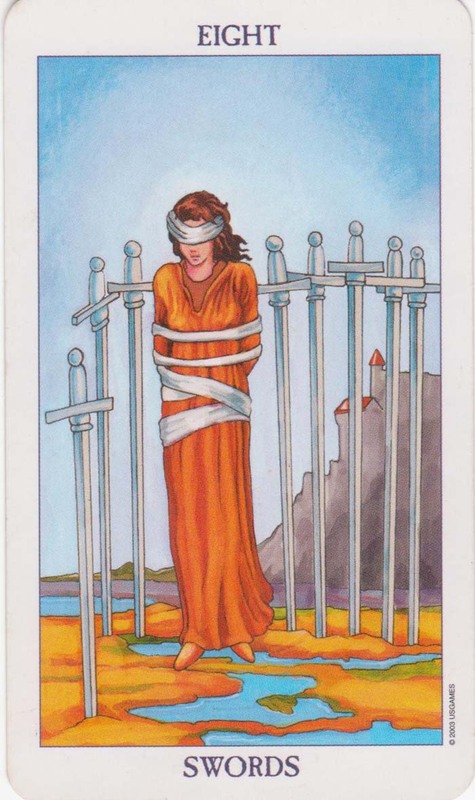 Or, do you feel unable to make or see a clear decision as in the Two of Swords? 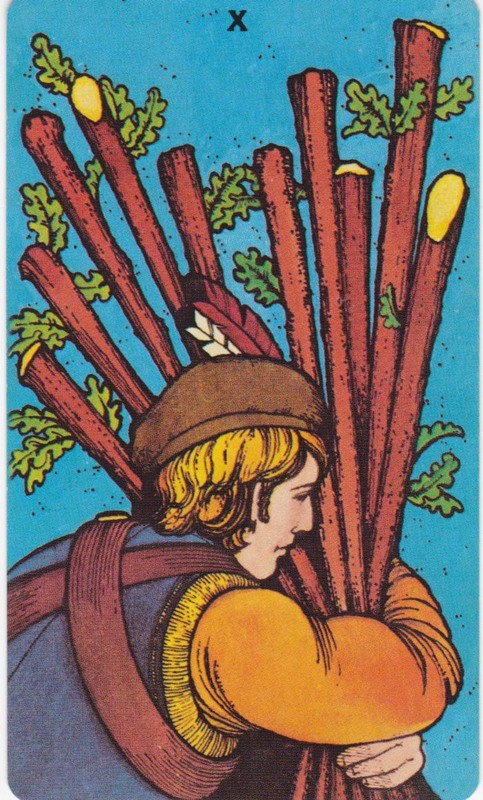 Or do you feel overwhelmed by the complexity of modern life as in the Ten of Wands? Do you feel lost or confused, disconnected to others or outside of God's grace? Are you angry and in despair about your situation? Are you resisting it, avoiding it, resenting it, fighting it? Perhaps you are ready for a change of strategy. Such a new strategy could be to make a conscious choice to relax into the situation that is troubling you. To "be" with it, without trying to make it go away. Another strategy would be to shift your focus onto the good in your life, the blessings that you do have. Even in your worst life experience, you can find some good to be thankful for. By accepting, even blessing, the very situation you seek to avoid, by counting other gifts and blessings you have, the energy around this situation could take a dramatic shift. Whatever is in front of you, bless it, include it, even embrace it – yes, even this situation, too. Images like those found in the Five of Pentacles challenge us to count our blessings, no matter what, to let go of our resistance and to live in the present. One of the more potent ways to use the Tarot images is through meditation, journaling and creative visualization. If you are in a difficult situation, using one of these challenge cards in meditation can help you to minimize the resistance, to be in the NOW, to ground yourself in the present moment. By embracing the imagery on the card, you may be training yourself to accept the situation itself, and thereby, allow for some unexpected or miraculous adjustments, or changes in the situation. You never know what miracles can happen when you step back from your mind, from your egoic state, from the need to be right, or from the desire to be superior. Let yourself be totally present. See what happens. Working with the cards in this way is a kind of “reverse psychology” in which you do the exact opposite of what your first reaction tells you to do. There is a wonderful Zen story that illustrates this concept. In the story, astudent asked Soen Nakagawa during a meditation retreat, “I am very discouraged, what should I do?” Soen replied, “Encourage others.” The very thing from which you are running is controlling you. The suffering you experience now comes from nonacceptance, an unconscious resistance to what is. The person you feel jealousy towards is controlling you. Any situation that is causing you to be in a reactive state is running your life. By choosing to embrace where you are, you automatically begin to de-tangle yourself from the issue. Use one of these scary Tarot cards to help you! You can try gazing at a card, carrying it with you, drawing it, placing it under your pillow at night or even having an imaginary dialogue with one of the figures in the image. Remember that the goal is to minimize the resistance that you have to your difficulty, to face it and to use the imagery to remind yourself to be grateful. There is a subtle spiritual power available when you work with the cards in this way. The mere act of choosing one of these challenge cards sends a message to your unconscious mind that you are ready and willing to accept a new approach, to transform a situation and to accept a healing. Just remember, "This, too" means embracing the very situation, the very difficulty that troubles you now. / Jack Kornfield, A Path with Heart, (New York: Bantam Books), 1993. pp. 335 –336.